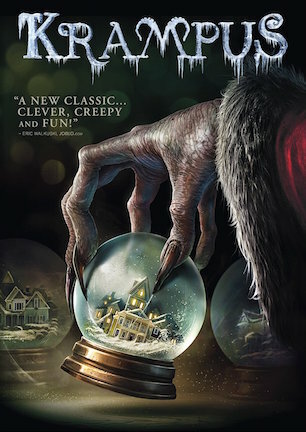 Krampus and his devilish minions terrorize a dysfunctional family that no longer believes in the Christmas spirit. Along with children Max and Beth and their German-speaking grandmother Omi, Tom and Sarah Engel host a holiday party at home for the extended family. Sarah’s sister Linda arrives with husband Howard, children Jordan, Stevie, Howie Jr., and baby Chrissy, and the sisters’ overbearing Aunt Dorothy. Chaos erupts during dinner when Jordan and Stevie bully Max over a heartfelt letter he wrote to Santa Claus. A sudden snowstorm ensues after Max tears up the letter and gives up on Christmas. Electrical power and phone lines go down. A strange snowman appears outside, as does a sack of presents on the doorstep. Beth leaves to check on her boyfriend Derek and encounters Krampus bounding throughout the snow-covered neighborhood. Beth hides underneath a DHL van with a dead deliveryman inside. Krampus goes away, but leaves behind a jack-in-the-box. A creature emerges from the toy and attacks Beth. Later that evening, Omi warns Tom and Howard to not go out at night, but the men take Howard’s truck to search for Beth. Tom and Howard find a stranded snowplow with its glass punched in. Tom and Howard find the inside of Derek’s house ransacked and covered in snow. The men follow Beth’s screams outside where something tries pulling Howard underneath the snow. Tom shoots at the unseen creature and it flees. Their truck destroyed, Tom and Howard franticly return to the house. While everyone sleeps later that night, Krampus lowers a gingerbread man down the chimney that attracts Howie’s attention. Howie bites the cookie, which turns sentient and captures Howie. Howie is pulled up the chimney while the woken family fights futilely to save him. A fire breaks out at the same time and destroys the Christmas tree. Omi tells everyone the story of how Krampus comes for feuding families who have given up on the spirit of Christmas. Omi explains that Krampus killed her family, but spared Omi to live as a reminder of what happens when holiday hopes are abandoned. Jordan and Stevie are lured to the attic by Krampus’ minions and are swallowed by the jack-in-the-box clown, now grown to an enormous size. Stevie is rescued, but Jordan vanishes. Gingerbread men terrorize Howard in the kitchen while the other adults confront sentient dolls upstairs. Krampus’ minions overrun the house and take Aunt Dorothy and Chrissy. Howard is also pulled away when he attempts to rescue his infant daughter. The minions scatter and leave at the sound of Krampus’ arrival on the rooftop. Tom, Sarah, Max, Linda, and Stevie decide to make a break for the abandoned snowplow. Omi willingly stays behind in order to finally face Krampus. Krampus emerges from the chimney with a bag of toys that devour Omi. When creatures attack outside, Tom has everyone go on ahead while he protects them with a shotgun. A creature pulls Tom underneath the snow. Sarah and Linda are also pulled beneath the snow right as Max and Stevie make it into the plow. Minions surround the plow and pull Stevie away through the snow. Krampus appears before Max, dropping a Krampus sleigh bell ornament surrounded by torn scraps from Max’s letter to Santa Claus. Krampus vanishes. Max walks though the snow and finds a nightmarish assembly of Krampus’ minions and captured family members. Max shouts that he rescinds his wish while demanding that Krampus release his family. Max tosses the sleigh bell into the snow and the ground cracks open to reveal a fiery pit. Max tells Krampus to take him instead of his family. Krampus holds Max over the pit. After Max apologizes with an explanation that he only wanted Christmas to be like it used to be, Krampus lets go, dropping Max into the fire. Max wakes in his bed on Christmas morning. Downstairs, he finds his entire family enjoying the holiday together. Max is the only one who recalls previous events, and presumes it to have been a bad dream until he unwraps a Krampus sleigh bell. The family suddenly exchanges uncertain looks with one another as the camera pulls back to show the Engel home inside a snow globe within Krampus’ lair. ‘Tis the season for celebration in the seemingly safe suburban setting of the Engel household. Upper middle-class mother Sarah takes a torch to her crème brulee while German-speaking granny Omi bakes cookies in the kitchen. Dad Tom has to chastise his children after son Max stirs up a fistfight at school, though that’s only a small source of stress considering the frustration and fright yet to come. Detouring out of “Christmas Vacation” comes Sarah’s tacky sister Linda and her boorish husband Howard. Howard is the kind of Budweiser-boozing blowhard whose idea of fine comedy is Larry the Cable Guy and whose guns, sports, and trucks obsession has him treating two daughters like boys. Add in a forgotten, fussy baby and a mouth-breathing mute for another bumpkin cousin, and this is not even close to the ideal Christmas young Max romanticized in his mind. Bullied, beaten, and broken when his heartfelt letter to Santa is ridiculed at the dinner table, Max tears up the paper and throws it to the wind with a “bah humbug.” Stomping the holiday spirit somehow summons a sinister storm that in turn conjures December devil Krampus to ride in right behind. The fabled Deutschland demon slings a sack on his shoulder bearing goblins instead of gifts. From killer kid’s toys and gingerbread beasts to choking colored light cords and sadistically snarling snowmen, every conceivable Christmas nightmare is soon made flesh to haunt Max and his brood. Krampus has come for every last Engel with a punishing reminder of why it isn’t wise to be a disbelieving Scrooge at year’s end. On the strength of just two feature films released eight years apart, writer/director Michael Dougherty has made a confident case for the crown as the king of holiday horror movies. Not only does “Krampus” rank right up there alongside perennial Xmas chillers like “Black Christmas” (review here) and “Silent Night, Deadly Night,” Dougherty’s film emerges every bit as essential for repeat viewings in December as his “Trick ‘r Treat” is for October. No creative effort is spared in putting together an imaginative and inspired production. Douglas Pipes’ musical score and a very cool animated interlude detailing Omi’s personal history with Krampus strike the spirit of a Tim Burton/Danny Elfman collaboration. Characterizations run the gamut from National Lampoon caricatures to relatable John Hughes archetype exaggerations. Each and every detail has a passion motivating its placement as something essential either to story or fun factor. “Krampus” mixes the merry mischief of “Gremlins,” family follies from “Home Alone,” and demented fantasy of “The Nightmare Before Christmas” for a wicked, wild, even whimsical take on holiday traditions that is as much of a fable about family values as it is an energetic and eerie terror tale. The movie’s message is as meaningful as “It’s a Wonderful Life,” while relentless yuletide mayhem entertains whether the gag is a blackly comic riff on seasonal absurdity or the awesome spectacle of an overgrown jack-in-the-box swallowing a child whole. Virtually everyone involved is eligible for the award, though casting directors Cathy Sandrich Gelfond and Amanda Mackey deserve MVP trophies for assembling a roster that is top shelf talent all the way down to a scene-stealing bulldog. Gelfond and Mackey demonstrate a spooky sixth sense for matching the right actor with the right role. Forced to eat fruitcake until you can think of just one other person better suited for any part and you will develop diabetes before coming up with a name. A mid-movie lull needs more spring in its step and an interpretive ending has been the subject of some debate. Such small quibbles aside, “Krampus” gives much more than it deserves to have taken away. The movie is as funny as it wants to be, as frightening as it needs to be, and director Michael Dougherty works with hands of both playfulness and precision to gift-wrap a package worth tearing into any time of year. April 29, 2016 by Ian Sedensky.